What Day Of The Week Was February 10? 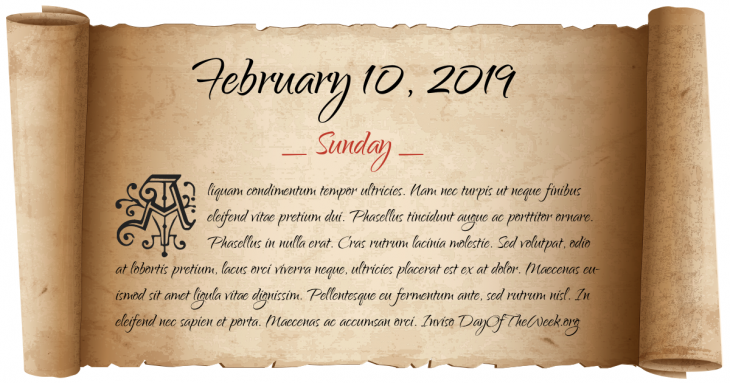 February 10, 2019 was the 41st day of the year 2019 in the Gregorian calendar. There were 324 days remaining until the end of the year. The day of the week was Sunday. The St. Scholastica’s Day riot breaks out in Oxford, England, leaving 63 scholars and perhaps 30 locals dead in two days. The fire extinguisher is patented. In round 13 of a boxing match at New York City’s Madison Square Garden, Primo Carnera knocks out Ernie Schaaf, killing him. Melbourne-Voyager collision: The aircraft carrier HMAS Melbourne collides with the destroyer HMAS Voyager off the south coast of New South Wales, Australia. The 25th Amendment to the United States Constitution is ratified. Who were born on February 10?